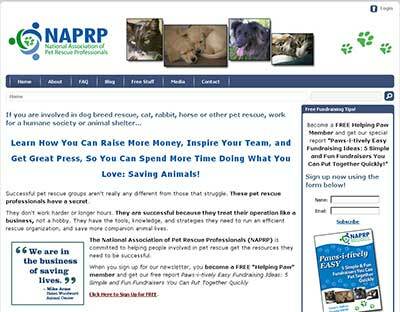 Susan founded and was the president of the National Association of Pet Rescue Professionals (NAPRP) an association that offered tools and information to help people working in humane organizations save more lives. After adopting her pets, Susan became interested in pet care and humane issues. To further her education, she has been a veterinary assistant and worked at animal shelters as both an employee and volunteer. These experiences led her to form the NAPRP. The organization operated from 2008-2012. The group was made up of people working for animal shelters, humane societies or rescue groups. NAPRP’s mission was to provide the knowledge, tools, and connection rescue professionals need to save more pets. Susan ran the association for a number of years trying to provide resources and increase the visibility and professionalism of rescue groups because the major humane organizations were largely ignoring the work being done by rescues. As a result of her work, Susan has been invited to speak at the HSUS Expo and twice was asked to speak at the Best Friends No More Homeless Pets Conference that is put on by Best Friends Animal Society. In 2009, she presented a workshop called “The 7 Habits of Highly Effective Fundraisers” which was based on information in her book Funds to the Rescue: 101 Fundraising Ideas for Humane and Animal Rescue Groups. Comments from Susan were included in the closing video at the conference (about 2 minutes in). You can read more about her experience on the Speaking and Media Kit pages. When Volunteers Run Amok – Although volunteers can be the lifeblood of an organization, “problem volunteers” can cause misery and mayhem. A licensed counselor, with degrees in Psychology, Sociology, and Educational Psychology, Barbara Bouchet explains how to recognize problems and deal with them before they get out of control. Meet Your Match – Dr. Emily Weiss, Ph.D. CAAB, ASPCA Director of Shelter Behavior Programs discusses the ASPCA’s Feline-ality and Canine-ality programs, which are designed to increase adoptions and reduce returns with assessment tools that help match up the right cat or dog with the right owner. Grant Readiness – Author Lorna McLeod, talks about what organizations must do before applying for grants. HSUS Programs – Kim Intino, CAWA, Director of Animal Sheltering Issues at the Humane Society of the United States talks about some of the many programs HSUS has available to help rescues and shelters. Surviving and Thriving – Faith Maloney, one of the founders of Best Friends Animal Society offers tips to avoid burnout and compassion fatigue, based on her 20+ years working with animals. Five Keys to Writing a Successful Grant Proposal – Grant writer Ron Flavin explains what makes a great proposal based on his experience helping clients raise more than $50 million in funding. Susan own pets all were adopted from animal shelters and rescue groups. After adopting her pets, Susan became interested in pet care and humane issues. She worked at an animal shelter both as an employee and a volunteer. She also was a veterinary assistant at a low-cost spay/neuter clinic. After discovering how little so many people seemed to know about caring for their adopted pets, she started writing “public service” pet care columns for the local newspaper. These articles later developed into her books Happy Hound and Happy Tabby. Susan created the NAPRP membership site in Dot Net Nuke. Members were able to log in and access audio recordings and other benefits from the site.